I had one of the best days ever this past month. My sweet friend Janice Rowe and I went quilt shop hopping to collect the Row by Row quilt block kits and patterns. 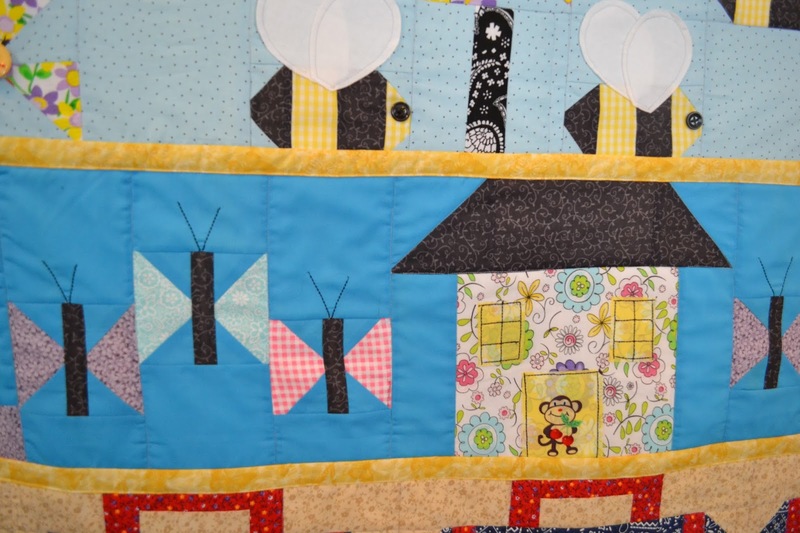 We had a hair brain idea to be the first to get the quilt done and turned it in and win a prize! We spent 2 days driving and shopping at the quilt stores in central Indiana. Then I spend a full 6 days cutting, sewing, ripping, re-sewing, quilting, but through blood (pens are sharp), sweat and a few tears (my back was killing me).... I finished my quilt first! I only purchased one kit as the proceeds went to support the humane society in Indianapolis, and it was the 9th row! The suitcase pattern came from a shop in Richmond. I was a bit worried about putting it together because I didn't get the kit and didn't have the little picture verse center blocks, but I did have something that worked just great. The rainbow pattern came from Crimson & Tate in Indianapolis on Mass Ave. Great store, super trendy. The row was sunrise or sunset and was made from solid fabric. OH NO ... that would have been to easy... hindsight is 20/20! This was one kit I probably should have purchased as it was the most difficult row of them all, and I thought I would just use all the strips of scraps I had already had on hand. I love the way it turned out, however it was so hard and it stretched a lot after the first cut. I started with that row and I am glad I did. If I left it to the end, I may have never finished the project. The top row Flying Geese came from The Back Door in Greenwood In. 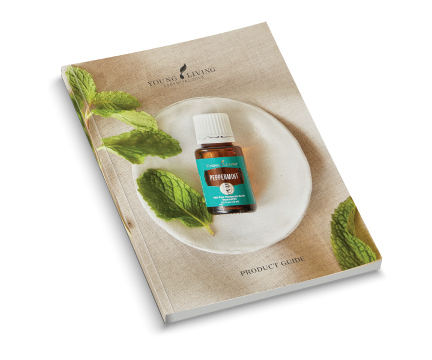 I just love that shop and all the samples they have. I could, well I do spend days looking and drooling, and touching every fabric, pattern, design and sample in there. The Bumblebee pattern came from my vary vary favorite store in Spencer Indiana, Unraveled. Lisa, the shop owner is a doll. I love her, her humor, her knowledge, the shop with all the vintage sewing machines. Lisa also designed her row and it was so easy to understand and complete. I turned my finished quit in to Unraveled, where it is now on display for a few weeks. Get there quickly if you want to see it in person. 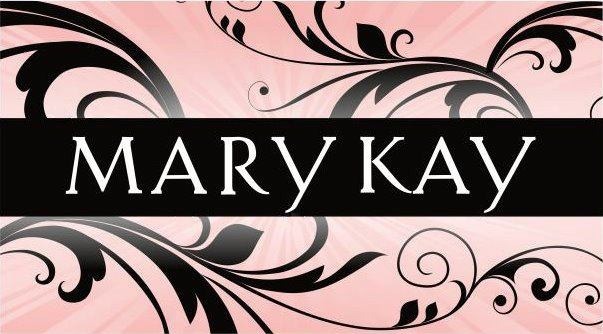 This next row came from Nancy's Fancy in Richmond In. The butterflies were super hard to figure out, so I kinda had to do my own thing. The center point is not as wide as the pattern showed but, it's done, it worked out okay and the monkey in the door doesn't care! This long row came from Quilts Plus or Quilts Quarters, cant remember what one, since we traveled to both. I don't have my patterns in front of me (all cleaned up and put away) but we went to both stores. 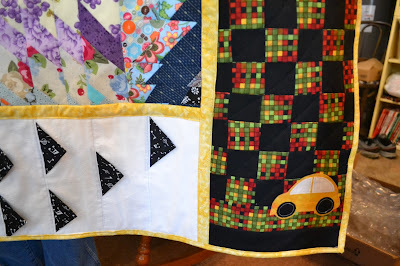 Thisrow was fashioned after the Indy500 race and I had to change it up and use some different fabric! Oh love the car! The black and white row is another flying geese pattern came that from Coffee Cup Quilts in Trafalger In. I had never been there so it was fun to visit the shop. The owner Claranna had the most beautiful quilt displayed, all 1"x1" or 2"x2" squares, (can't remember the exact size) of all colors, but who cares at that small of a square, the quilt was probably king size and it was magnificent! I cannot imagine cutting and piecing thousands and thousands tiny fabric squares. The first photo above is a better shot of this fun and easy row. Oh and you should see the quilts she has in the bathroom - wow! I love this scooter! So stinking adorable. Janice and I split a charm pack of this cute bundle. I took the peach and yellow fabric she took the blues and greens, then we made all our suitcases pilled on top the scooter. This pattern came from a little french inspired fabric shop in Indy called French Seams. Sooo cute, and the mom and daughter owners are as sweet as can be. I love this row! One of the requirements was to have a tag, so this is my tag on the 9th row. My name tag is also on the back of the quilt. 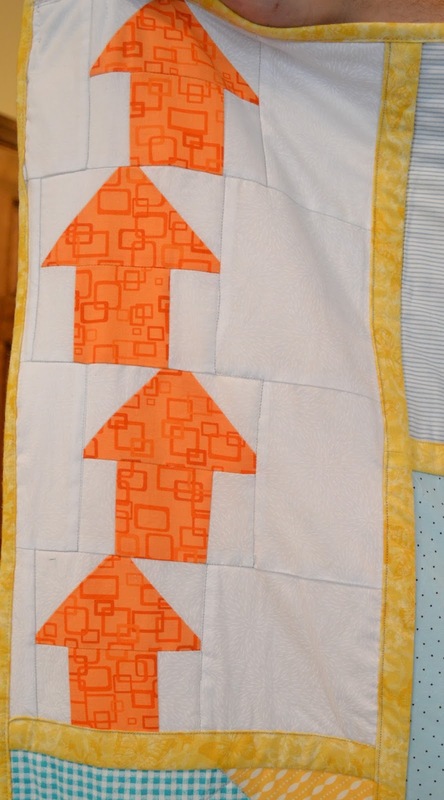 The 9th row are these cute arrows from this really fun orange fabric. I had to split the row in 1/2 so my finished quilt would be balanced. I am so happy with the way it turned out. 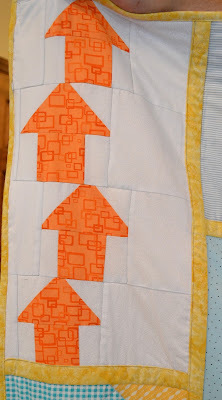 I learned a lot of new (to me) quilt block designs and how to fudge a few to get them to work because a few of the patterns were poorly written. I used up a pile of fabric I had in my stash yah! 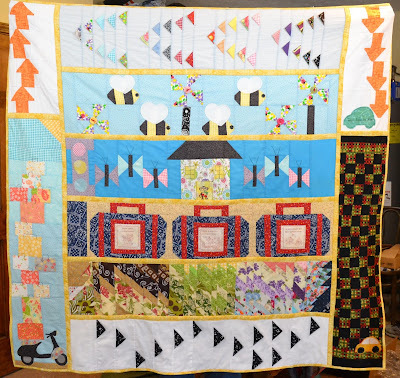 I learned to quilt as you go and found that I totally love it. I had a super great day turning it in to Unraveled and winning! Oh what did I win! First my family back, they were really missing me since I spent sun up to sun down in my studio for 6 days and nights. 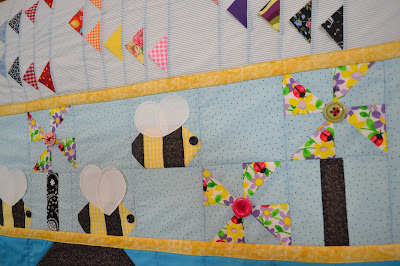 $25 fat quarters, and a bonus of $20 gift certificate because I used the bee block designed by Unraveled in the quilt. I also sold my quilt! Yep, our contractor friend saw me sewing on the last few buttons before I headed to Spencer to turn it in, and he purchased it for his new grand baby! Thaw was sooo awesome! 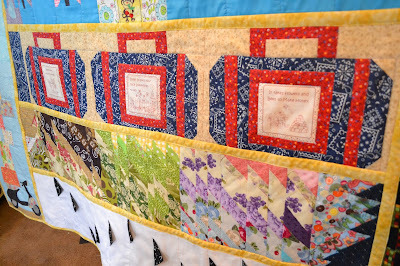 I will not do another quilt under a time restraint like this again... so I say so today! 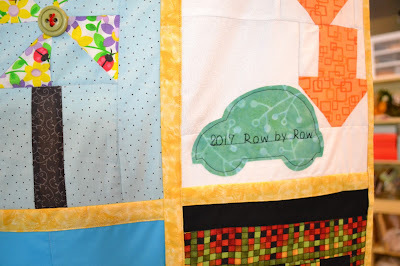 For more info on the Row by Row, google it and you will see all the rows from across the nation and tons of quilt stores to shop at!